On occasion, hoverfly larvae have been known to cause accidental myiasis in humans. This occurs when the larvae are accidentally ingested on food or from other sources. Myiasis causes discomfort, pain, or itching, however, hoverflies do not normally prey upon humans and cases of myiasis from hoverflies are very rare. Fredrik Sjöberg's book The Fly Trap concerns his enthusiasm for hoverflies on the island of Runmarö in the Baltic Sea. The island is a hotspot for hoverflies and other insects; Sjöberg has collected 58 species of butterfly there, and (in seven years of hunting) 202 species of hoverfly, including 180 in his garden. He estimates that in 2014 just 25 hoverfly enthusiasts were in the whole of Sweden. Stubbs, A.E. and Falk, S.J. (2002) British Hoverflies An Illustrated Identification Guide. Pub. 1983 with 469 pages, 12 col plates, b/w illus.British Entomological and Natural History Society [ISBN 1-899935-05-3]. 276 species are described with extensive keys to aid identification. It displays 190 species on colour plates. 2nd edition, pub. 2002, includes new British species and name changes. It includes European species likely to appear in Britain. Additional black and white plates illustrate the male genitalia of the difficult genera Cheilosia and Sphaerophoria. 1 2 3 4 5 6 7 "Hover fly". Encyclopædia Britannica Online. 2009. Retrieved December 5, 2009. 1 2 3 4 "Hoverfly". Hutchinson Encyclopedia. Helicon Publishing. 2009. Retrieved December 6, 2009. ↑ Reemer, Menno (2008). "Surimyia, a new genus of Microdontinae, with notes on Paragodon Thompson, 1969 (Diptera, Syrphidae)" (PDF). Zoologische Mededelingen. 82: 177–188. 1 2 Aguilera A, Cid A, Regueiro BJ, Prieto JM, Noya M (September 1999). "Intestinal myiasis caused by Eristalis tenax". Journal of Clinical Microbiology. 37 (9): 3082. PMC 85471 . PMID 10475752. ↑ Whish-Wilson PB (2000). "A possible case of intestinal myiasis due to Eristalis tenax". The Medical Journal of Australia. 173 (11–12): 652. PMID 11379520. ↑ Barkemeyer, Werner. 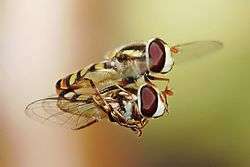 "Syrphidae (hoverflies)". Biodiversity Explorer. South Africa: Iziko Museum. Retrieved December 11, 2009. ↑ Thompson, F. Christian (August 19, 1999). "Flower Flies". The Diptera Site. United States Department of Agriculture. Retrieved December 11, 2009. ↑ Philip J. Scholl; E. Paul Catts; Gary R. Mullen (2009). "Myiasis (Muscoidea, Oestroidea)". In Gary Mullen; Gary Richard Mullen; Lance Durden. Medical and Veterinary Entomology (2nd ed.). Academic Press. pp. 309–338. ISBN 978-0-12-372500-4. 1 2 Larson, B.M.H; Kevan, P.G. ; Inouye, D. W. (2001). "Flies and flowers: taxonomic diversity of anthophiles and pollinators.". Canadian Entomologist. 133: 439–465. doi:10.4039/ent133439-4. ↑ Haslett, J.R. (1989). "Interpreting patterns of resource utilization: randomness and selectivity in pollen feeding by adult hoverflies.". Oecologia. 78: 433–442. doi:10.1007/bf00378732. ↑ Sajjad, Asif; Saeed, Shafqat (2010). 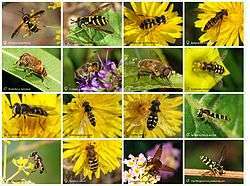 "Floral host plant range of syrphid flies (Syrphidae: Diptera) under natural conditions in southern punjab, Pakistan.". Pakistan Journal of Biology. 42 (2): 1187–1200. ↑ Primante, Clara; Dotterl, Stefan (2010). 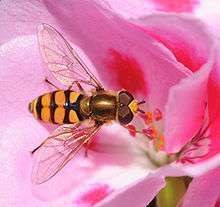 "A syrphid fly uses olfactory cues to find a non-yellow flower.". Journal of Chemical Ecology. 36: 1207–1210. doi:10.1007/s10886-010-9871-6. ↑ Campbell, Alistair, J.; Biesmeijer, J. C.; Varma, V.; Wakers, F. L. (2012). "Realising multiple ecosystem services based on the response of three beneficial insect groups to floral traits and trait diversity.". Basic and Applied Ecology. 13: 363–370. doi:10.1016/j.baae.2012.04.003. ↑ Stokl, Johannes; Brodmann; Dafni; Ayasse; Hansson (2011). "Smells like aphids: orchid flowers mimic aphid alarm pheromones to attract hoverflies for pollination.". Proc. R. Soc. B. 278: 1216–1222. doi:10.1098/rspb.2010.1770. ↑ Shi, J.; Luo, Y.B. ; Ran, J.C.; Liu, Z.J. ; Zhou, Q. (2009). "Pollination by deceit in Paphiopedilum barbigerum (Orchidaceae): a staminode exploits innate colour preferences of hoverflies (Syrphidae).". Plant Biology. 11: 17–28. doi:10.1111/j.1438-8677.2008.00120.x. ↑ "Diptera: Syrphidae". Landcare Research. Retrieved 2013-08-30. ↑ Grosskopf, Gitta (2005). "Biology and life history of Cheliosia urbana (Meigen) and Cheilosia psilophthalma (Becker), two sympatric hoverflies approved for the biological control of hawkweeds (Hieracium spp.) in New Zealand.". Biological Control. 35: 142–154. doi:10.1016/j.biocontrol.2005.06.013. ↑ Morris, Michael, C. (2000). "Coriander (Coriandrum sativum) "companion plants" can attract hover flies, and may reduce infestation in cabbages.". New Zealand Journal of Crop and Horticultural Science. 28: 213–217. doi:10.1080/01140671.2000.9514141. ↑ Hickman, Janice, M.; Lovei, G. L.; Wratten, S. D. (1995). "Pollen feeding by adults of the hoverfly Melanostoma fasciatum (Diptera: Syrphidae).". New Zealand Journal of Zoology. 22: 387–392. doi:10.1080/03014223.1995.9518057. ↑ Holloway, Beverley, A. (1976). "Pollen-feeding in hover-flies (Diptera:Syrphidae).". New Zealand Journal of Ecology. 3 (4): 339–350. doi:10.1080/03014223.1976.9517924. ↑ Campbell, Diane; Bischoff, M.; Lord, J. M.; Robertson, A. W. (2010). "Flower color influences insect visitation in alpine New Zealand.". Ecology. 91 (9): 2638–2649. doi:10.1890/09-0941.1. ↑ Bischoff, Mascha; Campbell, D. R.; Lord, J. M.; Robertson, A. W. (2013). "The relative importance of solitary bees and syrphid flies as pollinators of two outcrossing plant species in the New Zealand alpine.". Austral Ecology. 38: 169–176. doi:10.1111/j.1442-9993.2012.02389.x. ↑ Sjöberg, Fredrik (2014). The Fly Trap. Particular Books. p. 197. ISBN 978-1-846-14776-0. ↑ Barkham, Patrick (14 June 2014). "Fredrik Sjöberg: 'I realised I had to write my book for people not interested in flies'". The Guardian. Retrieved 15 March 2015.